You can't say enough about the culture that gave us the samurai and the honorable suicide. The Japanese made a religion out of the sword and a rapture out of combat. 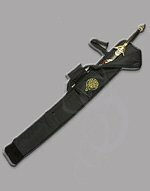 Draco Katana with Rayskin Handle and black scabbard. 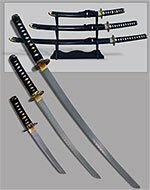 Very few blades have enjoyed the notoriety in history, literature, and film as the Japanese katana. 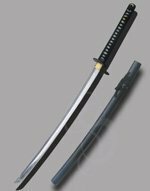 This fame is due to the legendary quality of the blade as well as the almost mystical relationship between the, katana and its wielder, the samurai. For a great part of Japanese history, only samurai were permitted to carry swords. If a peasant was found carrying a sword he would be killed on the spot. The samurai often carried other weapons besides the katana, such as the bow and spear. Often the bow was to be used first, and then followed by the spear. The bond between the katana and samurai welder was sacred. The sword was used as a last resort. The samurai believed the katana was linked to their soul and should only be drawn under the most serious situations. 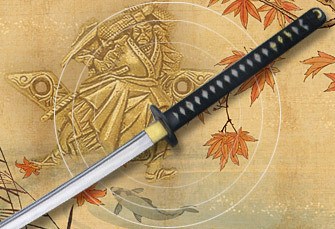 The katana was often worn paired with another smaller sword or dagger. 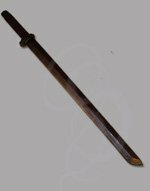 The shorter sword was a wazashi measured twelve to twenty-four inches in length. The dagger, a tanto measured six to twelve inches in length. The paired weapons were referred to as daisho(the big and the small). The long sword was used for cutting and the short blade for stabbing. The most expertise practicianer of Kenjutsu(samurai's sword art) could even wield both weapons at the same time. The legendary swordsman and author of the Book of Five Rings, Miyamoto Musashi (1584-1645) perfected the two-sword kenjutsu technique he called niten�fichi (two heavens as one) or nito�fichi (two swords as one). In that swordsman uses both katana and wakizashi at the same time. Musashi was rumored to have participated in over 60 duals and to have never been defeated. 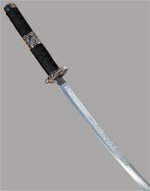 The katana is a long curved blade with chisel like point. 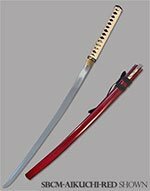 Because the katana is a single-edged sword it is also referred to as a back-sword, meaning it had an unsharpened edge or back, rather than a sharpened edge on both sides. 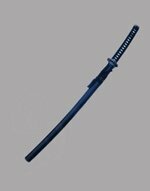 Because of is curved shape and chisel point, the katana could be used as both a slashing and thrusting weapon. 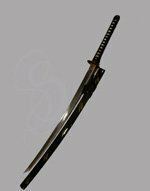 The katana has a blade length that measures approximately 28 inches. It was worn blade up through a belt-sash. 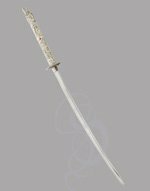 Another curved Japanese sword is the tachi, which is slightly longer than the katana with an average blade length of 31 inches. The tachi was worn suspended by cords from the belt. 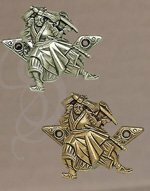 The tachi was favored by warriors on horseback where the added blade length provided the reach required to battle a samurai on foot. The earliest swords to appear in Japan were not of Japanese origin. They were imported from China and Korea. These swords were dual edged straight swords. The Japanese began forging their own swords around 2000BC. 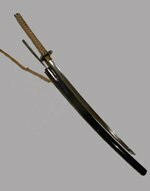 The early swords created by the Japanese were merely imitations of the straight swords from China and Korea, these swords were referred to as 'jokoto' or ancient swords. By 700 AD, the Japanese sword smiths were creating some of the finest swords ever known. The traditional Japanese sword changed from a straight blade to a curved blade. 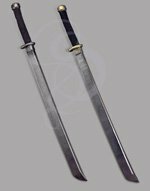 The curved blade could drawn from a scabbard more quickly, it was also is more effective as a slashing weapon when used by a mounted horseman. The art of sword making in Japan reached a pinnacle during the time known as The War of Onin(1467-1477). This was a period when civil war rocked the country and the armor and weapons created were considered superior even to those created today. The forging of the katana could take many days and was considered a sacred art. Several artisans were involved in the fabrication of the sword. One smith would forge the blade, another would fold the metal and another would polish the blade. There were even specialists who attended to sheath, hilt, and tsuba (handguard). The most famous part of fabrication process was the folding of the metal. As the name implies, folding is a process in which the metal is bent over itself and hammered flat. The folding process creates multiple layers which increases the strength of the metal. The number of folds varied from one sword to another, but swords with more than 16 folds were uncommon. Each fold results in 2n layers (where n is the number of folds). A sword folded 12 times would contain 212 or over 4000 layers. The completed sword was often tested by cutting through the corpses of condemned criminals. During the Edo period from 1603 to 1867, peace was widespread in Japan diminishing the role of the samurai. 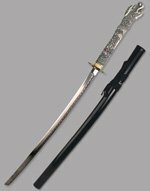 As the firearm became more commonly available in Japan, swords and the art of sword fabrication declined The swords manufacture after 1600�fs were considered inferior to those fabricated earlier in Japan�fs history. In 1867 the last shogun resigned and the emperor became the formal leader of Japan. In 1877 the Haitorei edict was issued which restricted the right to carry swords to military and police personnel. This officially abolished the samurai class in Japan. 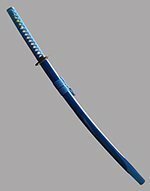 Although the katana has faded into history it still lives on in film and literature and the hearts of those who truly appreciate a weapon of honor.